As world central banking machinery continues to work at a fever pitch to try and keep its slapdash frankenmarkets chugging along, negative interest rates are an excellent example of a system that has gone desperately awry. 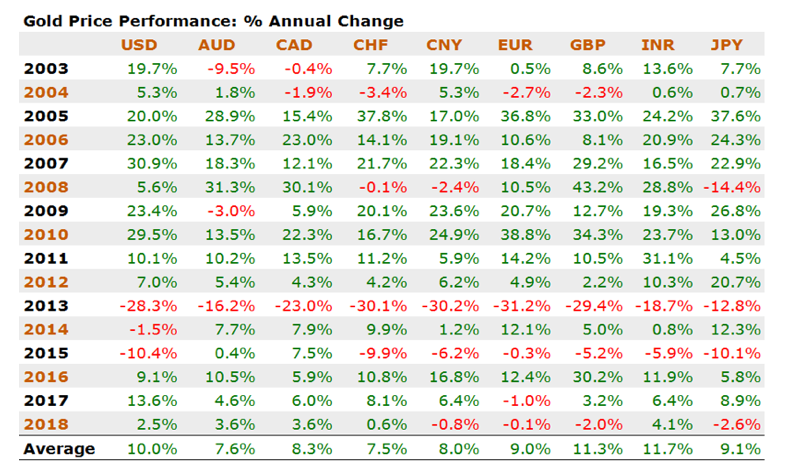 Gold has performed well against any fiat currency you'd care to name, an outperformance that will likely only be amplified amidst growing geopolitical and economic tensions. In today’s world of negative interest rates and the war on cash, any rational market participant would realize that something has clearly gone wrong in monetary policy as 1) negative interest rates has never happened before in history 2) the war on cash eliminates money in itself and forces individuals to bank deposits. Is this war on cash the transition to steep negative interest rates in the next recession? That definitely seems to be the primary reason as the Federal Reserve in recent months said that negative interest rates are possible if a recession hits. Talk about desperation. Gold has successfully enacted as a shield against the erosion of purchasing power via inflation over the last 15 years. Gold analyst Dan Popescu: "Gold has recently broken from a technical consolidation formation within a secular bull market started in 2000 ($250) with a potential technical target of $1,450 by the end of the year."